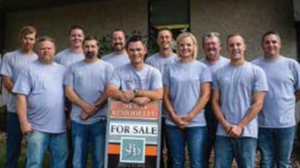 For the past 10 years, Marck de Lautour, owner of SBD Housing Solutions has been focusing on the metro Kansas City area for investment properties. His Rolodex of investors includes clients in Australia, New Zealand, Canada and California. Now with the success of hundreds of deals in the Mid West, SBD Housing Solutions is now expanding operations to Florida, specifically Tampa. Recently we interviewed de Lautour to get an inside glimpse of how this savvy investor is able to scoop up quality deals with built-in equity before anyone else does. Q: How did you land your latest rehab deal? A: It was an MLS opportunity, the owner occupant needed to sell. Q: What are some tips you have to research a property or area? A: You have to have someone local on the ground that is firmly entrenched in the market, able to jump on deals when they come up. We were very patient. Our company (SBD) started researching in the Tampa Bay area back in Jan 2012 and didn’t get our first buy until June 2013! Not fast, but we had to learn the market and we went through 3-4 different cities before settling in on the Bradenton / Sarasota area. Q: What were the terms of the sale? A: Cash, closing fast. Got them down from list price of $295, down to $264K. Then got it SOLD for $369,900 in under 70 days. But it was undervalued even at that price. Q: How did this deal compare to other deals you’ve done? A: We typically buy on the courthouse steps so having to wait 30 days to close on the purchase was a bit different! But we could get our contractors inside the home ahead of time so it certainly helped in getting the property turned quickly and efficiently. Q: Was the property rehabbed or was it a light cosmetic fixer? A: It was a cosmetic fixer upper, but there was an upstairs loft that converted easily with one wall built, into a 4th bedroom. Probably increasing the value by $10K-$15K with that addition alone. The rest was dolling up the bathrooms and kitchen with granite and travertine, and the whole house with some phenomenal dark hardwoods floors! Q: How does this rehab compare versus the properties in the past? A: Of all the homes we have completed in Florida this was the easiest. Extensive cosmetic makeover would describe it, approximately $25,000 of capital invested in the remodel. Q: How long was the property held? What tips do you have for managing an asset? A: Just 68 days prior to contract acceptance, then 25 days to close. Work with people you trust — simple as that. Have fun — laugh and learn from mistakes, and celebrate your successes! Please tell us specifics of the exit strategy. This was a true flip. We listed it and got a contract on it on day 5. We priced it aggressively to get a fast sale, but hit it right on the head. We poured over the numbers to make sure that we weren’t going to be asking too much. Every day a home sits is a time and money wasted! Q: What insight did you learn from this deal? A: Staging a home is HUGE factor in differentiating us from the competition in Florida. The cash offer actually asked us in their offer, “can the Seller vacate the home in 14 days if possible for a quick closing”…..which is hilarious as they thought we occupied it! It is obviously a vacant investment home. But testament to our wonderful stager! Moreover, I believe that there are simply some homes that will NEVER sell retail. Whether it is just dirty or totally run-down, with all the stuff on market right now, a home that is not good looking just won’t sell. Herein lies the opportunity for us to come in and do our value add. Turnkey investment opportunities in Ohio!